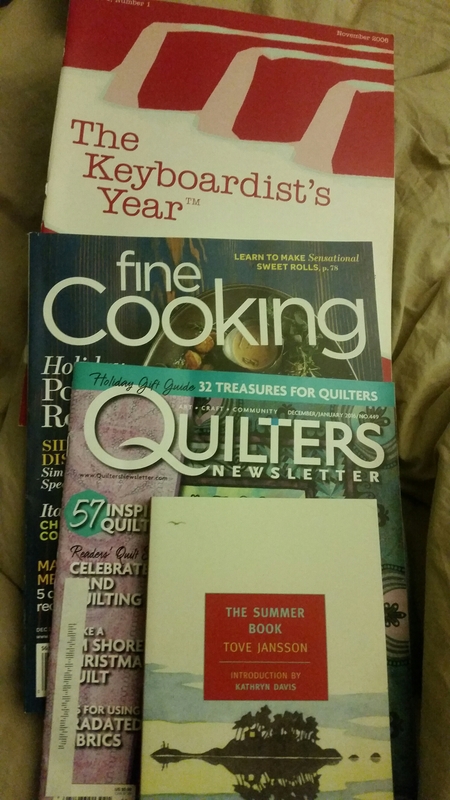 The lineup for tonight’s bedtime reading includes recipes, quilt patterns, sheet music, and a novel. Anne girl and I have been discussing reading habits. We are so alike in other areas, but when it comes to leisure reading our paths seem to diverge. I don’t read for relaxation. Reading is relaxing, but that isn’t my primary motivation for picking up a book. I want to learn something or be challenged by a new idea. Too much light reading makes me feel like I’m wasting my time. If I’m seeking relaxation specifically, I’m much more likely to hop into the bathtub or put my feet up and knit. It’s not that reading falls completely into the task bucket either. It is enjoyable and an activity I regularly and easily make time for. But I want more out of it. Two for one. I will be thinking about this more, I’m sure, trying to understand the ins and outs of what motivates and delights me. For tonight, I’ll enjoy these minutes before sleep as I review my service music for tomorrow. And then I’ll reread the article on meatballs from the current issue of Fine Cooking. 2016 may be the Year of the Meatball and I want to be prepared. Colorful patterns from Quilters Newsletter will inspire me to dream up new design ideas and maybe urge me towards finishing the green quilt I have in progress. And I’ll steal a page or two of Tove Jansson’s The Summer Book before I give in and turn out the lights. Whatever the source of this urge that drives me to read more and more, I am thankful for it.